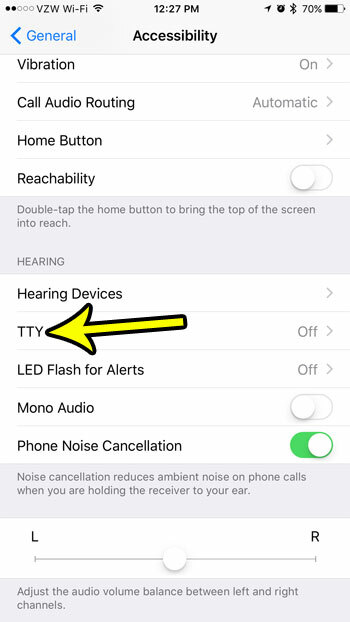 The iPhone includes many features that can help individuals who are hearing or visually impaired. 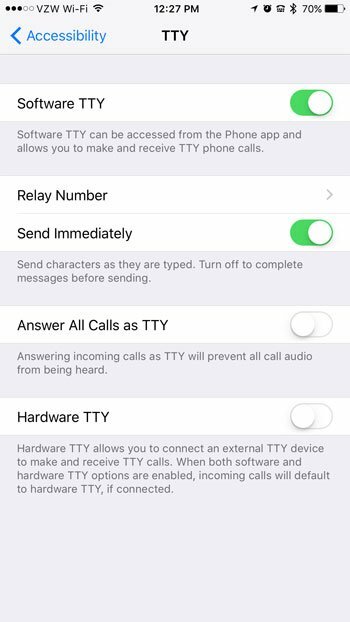 One of these options is called TTY and provides ways for TTY applications or devices to interface with the iPhone and make or receive TTY calls. When the TTY setting is enabled on an iPhone there is an icon at the top of the screen that looks like a rotary phone. If you see that symbol and do not need TTY, or if you would like to enable TTY on your iPhone, then you can follow the steps below to see where to find and enable it. Scroll down and choose the RTT/TTY option. Enable or Disable TTY options as needed. For additional information, including steps for these pictures, continue to the next section. The steps in this article were performed on an iPhone 7 Plus in iOS 10.3.2. You can find out more about iOS here. 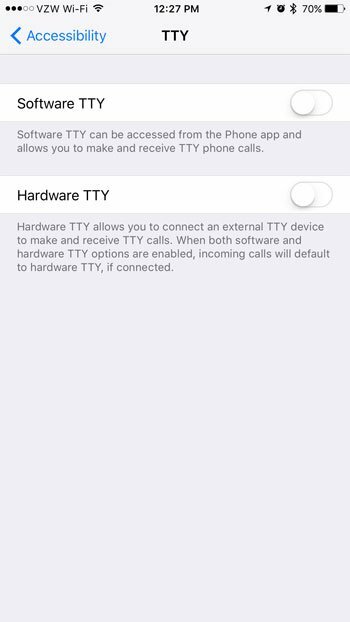 These steps will allow you to turn off the TTY setting on your device if it is currently active, or turn it on if you would like to use it. When the TTY setting is enabled for the device there will be a small phone icon at the top of the screen in the status bar. Note that there are options to use either software TTY or hardware TTY. If you elect to use the software option then there are some additional options that will appear. Step 2: Scroll down and select the General option. 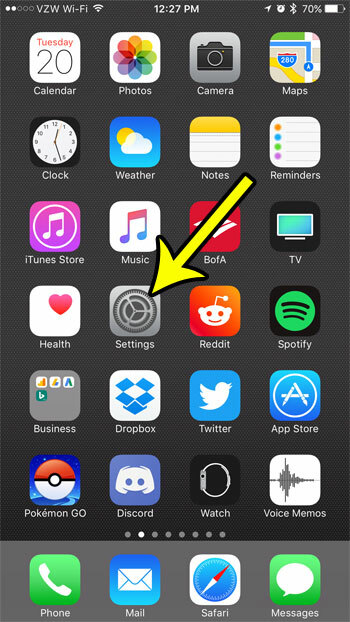 Step 3: Scroll down and tap on the Accessibility option. Step 5: Turn the TTY options on or off per your preferences. I have turned off all of the TTY settings in the image below. Note that if you are turning on TTY and elect the software option, then the additional options below will appear. 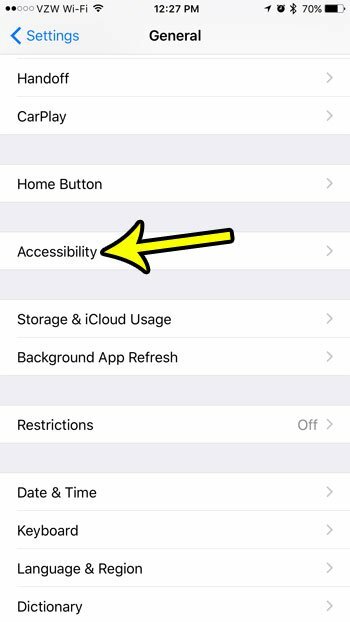 The Accessibility menu on your iPhone includes a number of other options as well. 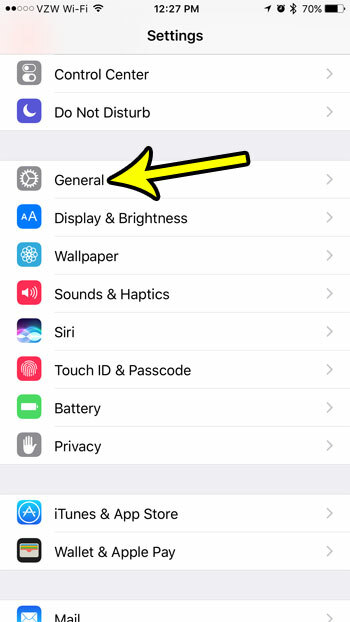 For example, you can turn off all of the vibration on your iPhone if you would prefer that the device not vibrate in any setting.